For some reason, having to hand wash clothes is a dreaded chore for most people. "It takes too much time." "It's messy." "I don't have enough space for the wet clothes." 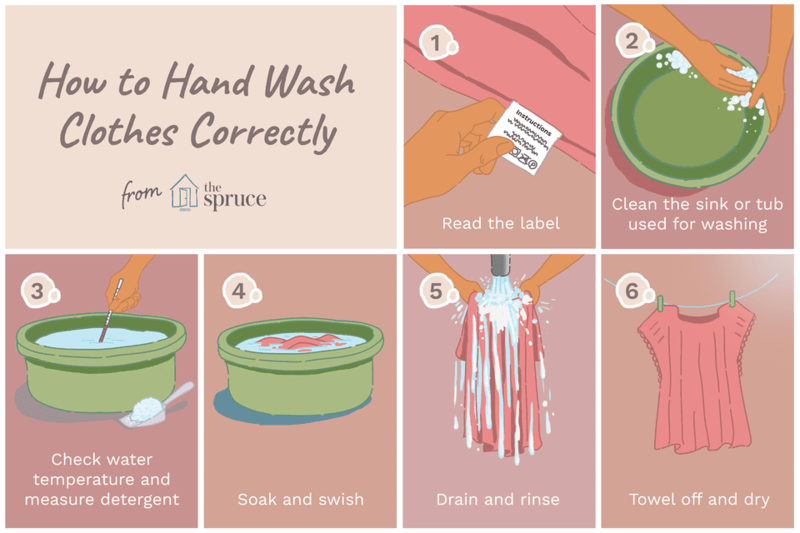 With this step-by-step guide and some helpful suggestions, hand washing clothes can be simple. Clothing and textile manufacturers place a care label on all products to give you instructions on the optimal way to care for your item. If the label says "Dry Clean" or "Dry Clean Only," can you hand wash the garment? Unless you are very experienced at the laundry, always follow the "Dry Clean Only" labels and take the garment to a professional cleaner. The label means that water or excessive agitation will probably damage the garment. Think of a structured suit. Even if the outer fabric is washable-like polyester-the inside structure of interfacings that give the garment its shape will not hold up in water. Most unstructured or soft items like sweaters that have the "Dry Clean" label can be hand washed. Read the label for fiber content and if you are not familiar with the fibers, learn more before you begin washing. This seems so simple, but we often forget that the sink that you are using for hand washing clothes needs to be spotlessly clean. Kitchen sinks can have traces of grease that will transfer to clothes. Bathroom sinks may have traces of skin care products that will bleach fabrics. When hand washing clothes, the water should always be cold or tepid, never over 85 degrees Fahrenheit or 29 degrees Celsius. Hot water can cause color bleeding or shrinkage. You should always fill the sink or tub with water before adding the items to be washed. The force of running water can actually stretch some fibers. If you need to add more water, you must deflect the force of the water with your hand or a cup. When hand washing, use one teaspoon (measure it!) of gentle liquid detergent. You do not need lots of bubbles to get a clean garment. Lots of bubbles just means lots of rinsing or a garment with detergent residue left in the fibers. Always add the detergent to the water before adding clothes and give the water a quick stir to be sure the detergent is dissolved and distributed well. Leaving plenty of room in the sink (never overload), submerge the fabric in the water. Be sure that the garment is completely saturated. Allow the garment to soak for at least five minutes and then gently swish it through the water. Never twist or scrub the fabric, or you may have stretching. Lift the garment from the sink and drain away the soapy water. DO NOT WRING the garment! Fill the sink with clean, tepid water and put the garment back in the sink to rinse. Swish through the water. Repeat this step until no suds are seen. If the garment is very lightweight like lingerie, it can be hung to drip dry immediately after rinsing. Always use a padded hanger that will not rust to prevent stains on the garment. For heavier items like sweaters, place the freshly rinsed garment flat on a white, thick towel and roll up to absorb the water. You may want to repeat this step with a second dry towel. Next, place the garment on a flat surface to dry in a well-ventilated room. Do not toss in a hot clothes dryer or dry next to direct heat. For knitted items, you should be sure the garment is reshaped before drying. If heavy items are hung, they will stretch or get marks on the shoulders from the hanger due to the weight. When drying items on a flat surface, flip the garment a couple of times to speed drying time. Always sort clothes by colors and fabric types before hand washing. Never hand wash dark and light colors together. If you don't have a large sink, use a plastic bucket or storage container for hand washing clothes. Use the bathtub for very large items. Do not overcrowd the sink or tub with too many clothes. You'll have greater success washing only one or two items at a time. Do not over soak. Leaving clothes to soak for an extended period can cause fading and can harm embellishments like beads, sequins, or embroidery. The gentle cycle on your washer is not the same thing as hand washing. The cycle lasts longer and has more agitation, even in a front load washer, that can harm the fabric. For the most delicate items, always hand wash.
NEVER place delicate, hand washed items in a dryer to "speed things along." What's Causing These Holes in my Clothes?